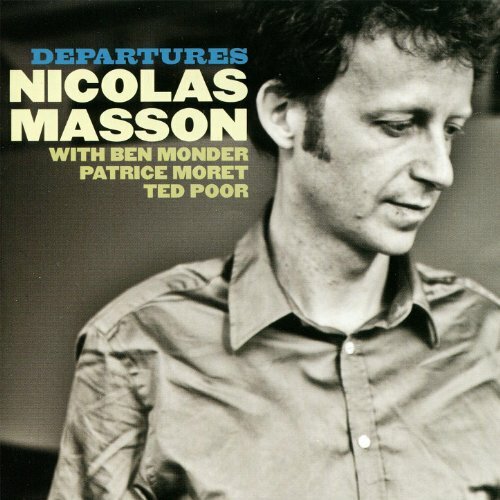 Nicolas Masson is a Swiss tenor saxophonist who studied with Frank Lowe, Ken McIntyre and Chris Potter; Departures is his fourth album as a leader (buy it from Amazon). The band includes guitarist Ben Monder (whose work I’ve liked before), bassist Patrice Moret, and drummer Ted Poor. The recording was made in Switzerland, midway through a string of live performances in late February 2010. This is slow, considered music. Masson and Monder are co-lead voices throughout; the guitarist is never reduced to mere background chording. On “The Faun,” he takes a scorching, distorted solo that, as he’s done in the past, reminds me of Bill Frisell‘s louder work. At other times, though, Monder is quiet, gracefully picking out melodies of thoughtful beauty. Masson, too, is an unhurried player. He doesn’t chase his tail, or buy time with broad gestures. Instead, he demonstrates the discipline of Stan Getz or Mark Turner, working his way around a central idea like a spider slowly encasing a fly. His lines unfold slowly, floating over the rhythm section like a paper kite, mostly hovering but occasionally catching a draft and spinning and flipping in wild arcs, only to return to its previous pattern after a mesmerizing moment. And speaking of the rhythm section: They get theirs on “Off Rhyme,” a nearly nine-minute track late in the album. (Departures is longish—nine tracks in an hour—but never really feels that way, possibly because of the sustained mood.) Drummer Poor seems to take a Paul Motian-esque approach, choosing to adorn the music rather than drive it, which leaves bassist Moret to do most of the heavy lifting. His tone is thick and resonant, with no buzz or twang; most of the time, he seems to create notes by rubbing them out of the strings with patient gentleness, rather than plucking. Thus, when he launches an outburst of somewhat wild strumming five minutes into “Off Rhyme,” and Monder begins to go all skronk-rock on the guitar, and Masson gets into this tunnel-vision solo that’s almost totally disconnected from what the rest of the band is doing, it’s the kind of thing that’ll stop your breath in your chest. Departures lives up to its title. It’s never exactly what you expect, but it’s internally consistent. Masson—who wrote all the pieces—knows what he wants, he brought these three other men together to help him achieve it, and they did so. Listening to it is almost like watching one of those heist movies where a disparate crew arrives, pulls a job, and goes their separate ways, and the thrill comes from watching people demonstrate competence and self-possession, as though the successful performance of the task is more important than the object or money to be stolen. This album is a demonstration of (individual and collective) intelligence, craft, and skill. It’s dispassionate, in the best possible way.